The cold weather in Sackville this week enabled workers from Birch Hill Construction to begin digging a huge water retention pond in a marshy area south of St. James and east of Lorne Streets as part of Phase II of the Lorne Street flood control project. 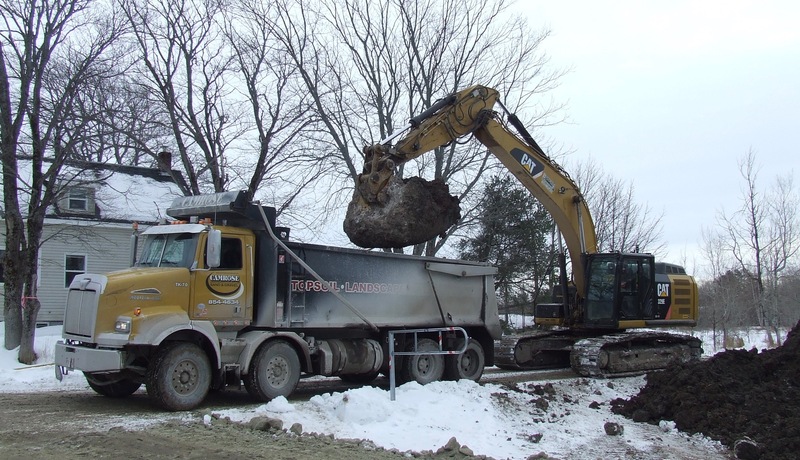 During Monday’s council meeting, town engineer Dwayne Acton said well-below-zero temperatures allowed the company to drive frost into the ground last weekend so that workers could begin excavating the pond and hauling the soil to disposal sites several kilometres away. The town has selected two disposal sites, both approved by the Southeast Regional Service Commission. The one being used on Friday was at 283 Queen’s Road near Frosty Hollow, a distance of 3.5 kilometres from St. James Street. To reach that site, trucks travel via Lorne Street to Queen’s Road and then to the disposal site. To reach the other site, trucks will use Lorne Street, Queen’s Road and Fairfield Road before travelling to 102 Crossman Road between Charlotte and York Streets, a distance of 4.4 kilometres. Since each truck carries an average of 10 cubic metres of soil, it will take about 5,000 round trips (nearly 40,000 kilometres of travel) to move the 50,000 cubic metres that will have to be disposed of to excavate the retention pond. To read the town’s latest update on the Lorne Street project, click here. This entry was posted in Town of Sackville and tagged Birch Hill Construction Ltd., Lorne Street Phase II. Bookmark the permalink. The disturbing thing about the dumping is that when I went to see Manager Lori Bickford at the Tantramar Regional Service Commission to ask permission to dump the 50,000 cubic metres of soil on my property across Crescent Street from the Terra Beata facility, I was told that it was impossible because it was zoned wetland and there was no way they could allow any material to be deposited there. Well the site is in the Sackville Industrial Park and runs all the way down to include the dyke system by our old Town Dump. It is within 800 metres of the project excavation site.. The base there is the same material composition as that which is being excavated from the St James Street area. The contractor that I was trying to help by supplying a dumping site is a LOCAL COMPANY. They wanted to keep their tendered price down as low as possible, which they could do by having a very short and practical route and as a result they were hoping to be the successful bidder and employ Sackville based trucks, equipment, and their drivers throughout the winter. The Crescent Street proposed site is now an unused and non productive marsh area. The 5000 tandem dump truck loads of fill would allow much of this 35 acre low lot to be brought up to the elevation of the surrounding properties, like the firewood splitting business next door, and would enable it to be used in the future as a productive area of our Industrial Park. The proposal was to cap the site with shale to enable the parking of tractor trailers. I cannot understand if any logic was used to take the material all the way down towards Frosty Hollow and then dump it in a residential/farming area just off Rte 106. Does anyone have any answers? Yes: there are two classes of citizens/subjects in this town. We’re in the ‘B’ class. So are most people. The rules, as written, and interpreted as narrowly as possible, are for us. If you were in the ‘A’ class, it wouldn’t be a problem, I’m sure.